In order to provide you with the full range of Battlefront Miniatures services, we sometimes need to collect information about you. Battlefront Miniatures is committed to safeguarding your personal information. Whenever you provide such information, we are legally obliged to use your information in line with all applicable laws concerning the protection of personal information. No website can be completely secure; if you have any concerns that your Battlefront Miniatures account could have been compromised e.g. someone could have discovered your password, please get in touch straight away. 2. What information will Battlefront Miniatures collect about me? 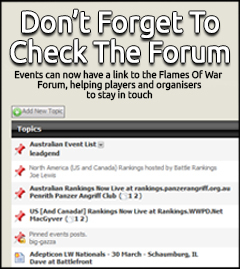 When you participate in, access or sign up to any of Battlefront Miniatures’ services, activities or online content, such as newsletters, competitions, message boards, web and mobile notifications, telephone, or create an account using Battlefront Miniatures’ online registration system we may receive personal information about you. This can consist of information such as your name, email address, postal address, telephone or mobile number, as well as information collected about your use of Battlefront Miniatures services. Please note that sometimes we will require you to provide additional personal information, and sometimes sensitive personal information (e.g. if you’re placing an order for product, we may collect credit card and address information. 3. How will Battlefront Miniatures use the information it collects about me? If you have registered for a Battlefront Miniatures account this might also allow you to login to other Battlefront Miniatures sites and services. These services might be run by the Battlefront Miniatures or they could be run by Gale Force Nine LLC, or appear under the brand names Flames of War or Team Yankee, or a combination of these. To provide you with a seamless experience, it may be necessary to share your personal information between these organisations. We will only share what we need to internally in order to provide the service you are using – we will never routinely share all of the data we each hold about you. Your Battlefront Miniatures account will always be covered by the policies of this website. But, please be aware that additional policies may apply if your Battlefront Miniatures account is linked to another account. 5. When will Battlefront Miniatures contact me? for marketing purposes, as set out in section 6. We will never contact you to ask for your Battlefront Miniatures account password, or other login information. Please be cautious if you receive any emails or calls from people asking for this information and claiming to be from Battlefront Miniatures. Battlefront Miniatures will only send you marketing emails or contact you on Battlefront Miniatures platforms where you have agreed to this. We offer regular emails, including a weekly update, to let you know about Battlefront Miniatures products and services. 7. Will the Battlefront Miniatures share my personal information with anyone else? We will keep your information within Battlefront Miniatures except where disclosure is required or permitted by law (for example to government bodies and law enforcement agencies, including for child protection reasons) or as described in this section and section 8. Generally, we will use your information within Battlefront Miniatures and will only share it outside Battlefront Miniatures where you have requested it or given your consent. We may share your personal information internally (i.e. with other Battlefront Miniatures divisions), for example, we share some personal data with Gale Force Nine LLC to allow purchases of their product lines. Please see section 3 above for more details. If you post or send content which may reasonably be deemed to be offensive, inappropriate or objectionable anywhere on or to Battlefront Miniatures websites or otherwise engage in any disruptive behaviour on any Battlefront Miniatures service, Battlefront Miniatures may remove such content. Where Battlefront Miniatures reasonably believes that you are or may be in breach of any applicable laws, for example on hate speech, Battlefront Miniatures may disclose your personal information to relevant third parties, including to law enforcement agencies or your internet provider. Battlefront Miniatures would only do so in circumstances where such disclosure is permitted under applicable laws, including data protection law. 9. How long will Battlefront Miniatures keep my information? We will hold your personal information on our systems for as long as is necessary for the relevant activity, or as long as is set out in any relevant contract you hold with Battlefront Miniatures. If you delete your Battlefront Miniatures account then your personal information will be deleted provided no monies are owing, and the remaining information is anonymised for analytical purposes. For further information about deleting your Battlefront Miniatures account, please see section 10 below. 10. Can I find out what personal information Battlefront Miniatures holds about me? A cookie is a small amount of data, which often includes a unique identifier that is sent to your computer, tablet or mobile phone (all referred to here as a “device”) web browser from a website’s computer and is stored on your device’s hard drive. Each website can send its own cookie to your web browser if your browser’s preferences allow it. Many websites do this whenever a user visits their website in order to track online traffic flows. Similar technologies are also often used within emails to understand whether the email has been read or if any links have been clicked. If you continue without changing your settings, we’ll assume that you are happy to receive all cookies on the Battlefront Miniatures website. On Battlefront Miniatures websites, cookies record information about your online preferences and allow us to tailor our websites to your interests. Information supplied by cookies can help us to understand the profile of our visitors and help us to provide you with a better user experience. It also helps us recognise when you are signed in to your Battlefront Miniatures account and to provide a more personalised experience. Please note that during your visits to Battlefront Miniatures websites you may notice some cookies that are not related to Battlefront Miniatures. To support our hobby, we sometimes embed content from social media and other third party websites. These may include YouTube, Twitter, Facebook, Instagram, Pinterest and Flickr. As a result, when you visit a page containing such content, you may be presented with cookies from these websites and these third party cookies may track your use of the Battlefront Miniatures website. Battlefront Miniatures does not control the dissemination of these cookies and you should check the relevant third party’s website for more information. If you continue without changing your settings, we’ll assume that you are happy to receive all cookies on the Battlefront Miniatures website. Where Battlefront Miniatures embeds content from social media and other third party websites, some websites may use Google Analytics to collect data about user behaviour for their own purposes. Battlefront Miniatures does not control this. For more information, see the Google webpage “How Google uses data when you use our partners’ sites or apps”. Your web browser may also provide Battlefront Miniatures with information about your device, such as an IP address and details about the browser that you are using. We use information provided by your browser or by the link that you have clicked to understand the webpage that directed you to Battlefront Miniatures and this may be captured by performance cookies.